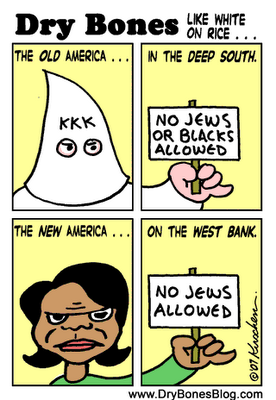 Condi compared the Jihadis “Palestinians” to blacks in the civil rights movement. She is evil and bad for America. I believe she is an anti-semite and hates Israel for being a Jewish state. She is trying to make Israel week so terrorist can destroy it. A suicide bomber was caught a week later at the very check point she demanded Israel dismantle. I think she wants to see jewish blood and innocent Jews die. 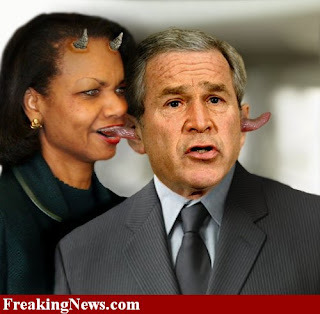 Condi is destroying the Bush doctrine and making the world a worse place to live. The Bush Doctrine is the name given to national security guidelines first outlined by President Bush in a June 2002 speech. It places greater emphasis on military preemption, increased military strength, unilateral action, and a commitment to “extending democracy, liberty, and security to all regions. What makes the Bush Doctrine so different is the need sometimes to employ force preemptively, to stop an attack before it happens. Condi Actively Campaigning For VP Spot? NOOOOO! I really hope McCain uses his brains and rejects her campaign to be VP. She would the worst VP for Israel. She totally buys into the Paliwood lies and mistakenly compares there problems with the 60’s civil writes movement. Anyone active in the McCain campaign please pass on the message that McCain will lose major support if he has her a running mate. I will never cast a vote with her on the ticket. ABCNews’ Mary Bruce Reports: Secretary of State Condoleezza Rice is actively courting the vice presidential nomination, Republican strategist Dan Senor said. Senor explained that Rice’s history in public office would make her a prime candidate, especially in light of presumptive Republican presidential nominee Sen. John McCain’s emphasis on experience throughout his campaign. ‘What the McCain campaign has to consider is whether or not they want to pick a total outsider, a fresh face, someone a lot younger than him, a governor who people aren’t that familiar with,’ Senor said. ‘The challenge they’re realizing is that they’ll have to have to spend 30 to 45 days, which they won’t have at that point, educating the American public about who this person is. Olmert is a traitor to the Jewish people and the state of Israel. I think he should step down now. Anyone that is not stepping out of his coalition is spitting on the Torah and has blood on their hands, Shas I am looking at you. It is just sick what Olmert is doing to the State of Israel. Some people blame Rice but I blame Olmert. After hearing this story yesterday I find that Rice is just a pawn and Olmert is the true problem for Israel. He said someone asked Bush something like: Do you think the American President that causes policies to devide Jeruslem will be blessed or cursed? Bush said cursed and he is doing all he can to make sure Olmert doesn’t do that. I hope the Jerusalem post story bellow is wrong and Olmert loses his coalition or loses his ability to be the PM this week. The Knesset’s winter session marched in like a lion and out like a lamb. It began in October, amid speculation about whether Prime Minister Ehud Olmert would survive the impending release of the 629-page Winograd Report. It ended Wednesday, with a 117-second Olmert speech in which he thumbed his nose at the people who six months earlier were sure that they would oust him. Now Olmert has six weeks free of any annoying no-confidence votes, sordid speeches and pesky parliamentary perfidy. But he is not free of politics. This week proved that even when US Secretary of State Condoleezza Rice comes to town to talk peace, and Syrian President Bashar Assad drafts reserves to hint at war, the lead headlines in the Hebrew press and the general public discourse will still focus on whether there will be war or peace in internal Israeli politics. Current and former defense ministers Ehud Barak and Amir Peretz dueled in Labor. Shlomo Benizri became the seventh MK convicted in Shas. Internal Security Minister Avi Dichter unleashed a fierce attack on the government’s diplomatic policies in Kadima. And everyone speculated about how long Olmert would be able to hold onto power in the face of last Friday’s Dahaf Institute poll, which found that 59 percent of Israelis considered him a failure, and which ranked him tied with Barak for last in the ratings of Israel’s best prime ministers. The latest spin that emerged this week was that Olmert would initiate an election as early as next month, when US President George W. Bush comes to town to celebrate Israel’s 60th birthday. Rice reportedly told an Israeli leader on Sunday that she wanted the Israeli and Palestinian negotiating teams to reach a deal by then on a declaration of principles that Bush could announce during his visit. Politicians speculated this week that Olmert could take that declaration and immediately initiate an election as soon as possible; during the campaign, he would use the deal as his diplomatic platform to try to win another four years in power. Senior politicians in all three of the largest parties spoke this week about a ‘May surprise’ as a realistic scenario. The thinking behind such a move would be for Olmert to try to catch his rivals in Likud and Labor when they are down. The only problems with this thinking are that it makes no political sense for an unpopular prime minister like Olmert to unnecessarily risk ending his political career; that no planning has been done by Olmert or his associates behind the scenes to prepare for such a move; and that Israel never holds elections in the summer. Likud faction chairman Gideon Sa’ar has been pushing for months to hold the next general election on November 4, which coincidentally is the date of the American election, and not coincidentally is when Israelis will go to the polls to elect their mayors. Combining the elections would save the country lots of money and could potentially strengthen the larger parties by encouraging a higher turnout. But it could also create headaches, because the party funding for the two kinds of races is handled differently, and because 17-year-olds are allowed to vote for mayors. This scenario could come about if Barak decides he needs to initiate an election soon to save his credibility, or if Shas decides to repent by toppling the government over negotiations on Jerusalem that its leaders should know full-well are in fact taking place. Barak told his associates this week that he does not see himself taking any steps to leave the coalition until after the municipal elections, because government funds give the party an advantage. Shas also needs more time to finagle more funds for its pet causes and ensure that mentor Rabbi Ovadia Yosef’s son becomes chief rabbi of Jerusalem. November 4 is of course not only the date when people will go to the polls in Detroit, Dimona, Deganya and Denver. It is also D-day for the talks with the Palestinians that were initiated in Annapolis. Olmert will do everything possible to reach a final-status agreement with the Palestinians by that deadline, to ensure his legacy and to give a parting gift to his close friend, US President George W. Bush. He could then initiate an election 90 days later to run on that deal and try to win support from the entire center-left of the political map. Same scenario as the last one, except that this time, Shas leaves the government when the Annapolis plan is unveiled, and Olmert manages to hang on for a while with a minority coalition, thanks to votes from Meretz and Arab MKs. Holding on for another couple of months would allow the state budget to pass, and would accomplish an important goal for Olmert: He would last longer as prime minister than his rival, opposition leader Binyamin Netanyahu. Olmert has already passed Barak and Moshe Sharet in longevity. If he passes Netanyahu, he could try to make the case that he was not among Israel’s worst prime ministers. this possibility, in part because they cannot think so far in advance, and because they doubt that any government could last so long without an upheaval. But this is the Middle East, where instability is a fact of life. Wars break out that have the power of persuading even Israelis to put politics aside for a while. This could delay an election that looked like it would have been in the spring to the fall. This is the actual date set by law for the next election. Olmert says all the time that this is when the next election will be held. But it is doubtful that even Olmert believes that. Election dates in Israel haven’t been a sign of when an election will be held for decades. It would take a miracle for Olmert, who hit a nadir of three percent in the polls after the Second Lebanon War, to finish out his term. And though miracles may happen in Jerusalem, they won’t for Olmert.